Does your dog inhale his food faster than a turbo-charged Electrolux? Eating too fast is considered one of the risk factors for life-threatening canine bloat and torsion, known as “stomach flipping.” Ugly Dog encourages everyone to take all precautions possible. 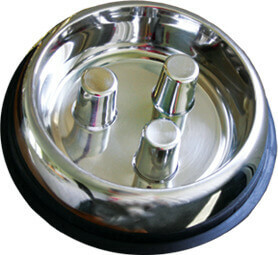 The posts in the bowl force your dog to eat slower. Non-tipping design, dishwasher safe, 5-cup capacity. Available in heavy duty blue plastic or in stainless steel with a rubber gripping edge. Blue Brake-Fast is made in USA.